At a Topical Issues Luncheon held yesterday by the Canadian Associate Petroleum Land Agents -CAPL- in Calgary, the talk of the day was the differentiation in markets for various assets. From a resource perspective, heavy oil is fetching $40k/barrel, whereas light crude is getting $60-$70k/barrel. Al Tambosso of Sayer Energy Advisors was a speaker at the luncheon painted a picture of the discrepancies between the commodities. Included in his message was the expectation that for oil you will pay, on average, the Proven + Probable (“P+P”) value, versus dry gas where purchasers are only paying for Proven reserves. This makes dry gas a bargain if you believe in the future of it. It makes it a terrible waste of time and resources if you don’t believe the economics can work. A recent report put out by First Energy started the rumblings of a further plunge to come for dry gas, with talks of prices going as low as $1.50/mcf or lower, as storage capacity is already starting to be taken up. And sadly, for producers, there doesn’t seem to be a quick fix on the horizon. The Kitimat LNG facilities in the works won’t be here soon enough to provide a short term fix for natural gas, though they are needed for the long term. So what does that leave for the dry commodity that’s getting to flare than to sell? For the contrarian investor looking for a deal, there will be bargain basement prices ahead for gas properties, but the turnaround to profitability isn’t so simple without major buyers. While there’s little evidence of correlation between oil and gas prices these days, the way out of gas’ rut could come from the oil sands. The push towards liquids rich gas plays in areas, like the Bigstone area of the Montney, are still providing exploration into gassy zones, but provides a cheap gas source that can be utilized by energy hungry oil sands operations. Cheap gas can equal bigger profit margins for oil sands operators, as gas is needed in the extraction process. 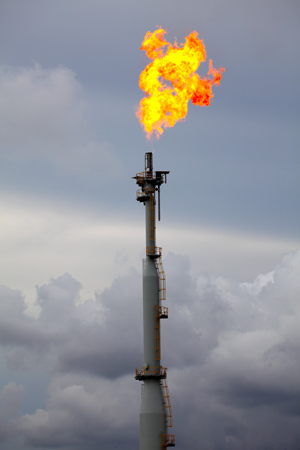 Gas can be burned off on site or converted into electricity by Cogeneration power plants. What could result in the future is a push by oil sands producers purchasing or simply taking over these currently low-valued gas properties. Right now it is definitely a gloomy time to be gassy. But, for primary gas producers, this can’t last forever. In the meantime, the challenge remains for those who are charged with the responsibility of keeping these gas properties economic. Whether that comes from shaving costs at an in-house level, or dumping the properties onto willing oil sands producers will be up for grabs, and depends on the forward-looking sentiments of the gas producers left with the problem to deal with.